Discrete wire, or lead wire, is the backbone of any interconnect or cable. Within this blog post we break down for you the anatomy of the basic hookup wire and the compositions that can be used as a single unit or grouped together to produce a multi-conductor or multi-pair cable. All wires start off as a rod or a coil of wires with many times the diameter desired for the finished product. This rod or coil is drawn through a series of dies with each die reducing the diameter of the rod by a set percentage. As the wire is drawn through the dies its volume does not change so as the diameter decreases the length increases. In most instances, the rod or coil will need to be run through more than one draw with each draw being of a smaller size die to ultimately reach the desired diameter and therefore American Wire Gauge (AWG) size. Wires are identified by their AWG size, which is a standardized system used predominantly in North America since 1857 for the diameters of round, solid, current conducting wires. The dimensions of the wires, and therefore the AWG size, are listed in American Society for Testing and Materials (ASTM) standard B258. Increasing AWG sizes denote decreasing wire diameters. This gauge system originated in the number of drawing operations needed to produce a given gauge of wire. Smaller size wires require more passes through the drawing dies so have a higher gauge size number. Wire comes in solid or stranded designs. Mainly circular in cross-section, wire is also available in square, hexagonal, and rectangular, among other cross sections. Solid wire consists of a single piece of metal wire and is less expensive to produce than stranded wire is. A solid wire has less flexibility than a stranded wire of the same AWG size and has a smaller cross section than a stranded construction for the same AWG size. Stranded wire is constructed of smaller AWG wires bundled together to form a larger conductor. As mentioned previously, stranded conductors are more flexible than a solid conductor of the same AWG size and tend to be a better conductor than a solid wire. This is because of the greater surface area of the individual wires when compared to the surface area of the solid conductor. The more individual wire strands in a wire bundle the more flexible, kink-resistant, break resistant and stronger the wire becomes. A major drawback of more strands in a wire is the increase of manufacturing complexity and therefore a higher cost. For geometrical reasons, the lowest number of strands usually used to build a wire is 7, with one in the middle and 6 surrounding the one in close contact with it. Again from a geometrical standpoint, the next number of strands is typically 19. 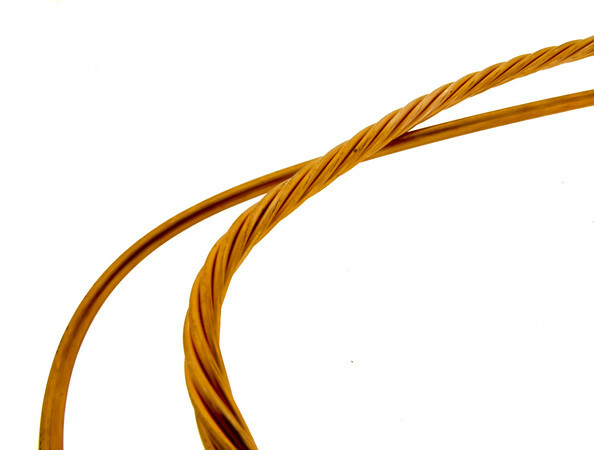 Larger strand counts are typical in very large AWG wires. For flexibility, a higher strand count is more advantageous and provides conductors able to be exposed to repeated movement. Concentric strand consists of a central wire or core surrounded by one or more layers of helically laid wires. Each layer after the first has six more wires than the preceding layer. Each layer is usually applied in a direction opposite of the layer under it. A bunch strand is a collection of strands twisted together in the same direction without regard to the geometric arrangement. A rope strand is a collection of concentric stranded groups which are twisted together. A sector conductor is a stranded conductor whose cross-section is approximately the shape of a sector of a circle. A multiple conductor insulated cable with sector conductors has a smaller diameter than a corresponding cable with round conductors. A compact strand is a round or sector conductor having all layers stranded in the same direction and rolled to a predetermined ideal shape. The finished conductor is smooth on the surface and contains no interstices or air spaces. The result is a smaller diameter. 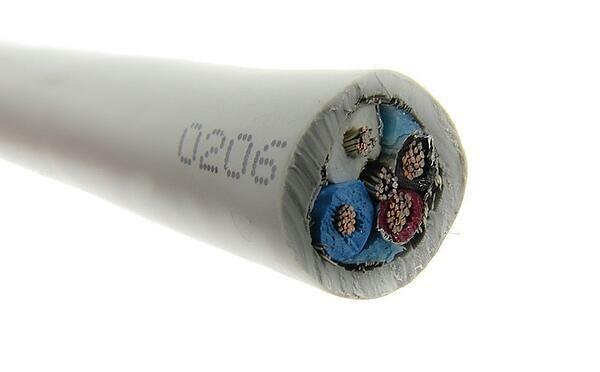 Cable conductors are supplied as a bare conductor with no coating or with numerous other coatings. Common coatings include tin, silver, and nickel. Tin is the most common coating and is used for improved corrosion resistance, solderability, and to reduce friction between strands. Silver coatings are used in high-temperature environments and in high-frequency applications. Nickel is used in temperature applications over 200°C, but nickel exhibits poor solderability and higher electrical resistance. Conductors need to be electrically isolated from other conductors and from the environment around them to prevent short circuits and for safety. Insulations are used to provide this isolation. The most common insulator is a polymer or a plastic. Different environments could call for specialized compounds that can withstand high temperature applications and allow for high current carrying ability, or ampacity. Most hookup wires are produced to be UL rated to a specific UL Style. Every manufacturer of a hookup wire rated to a specific style must produce the wire in the same fashion. For instance, if a hookup wire is to be rated UL Style 1061 it is built using a SR PVC (Semi-Rigid PVC). There are many manufacturers of PVC but for a hookup wire to be UL rated the PVC that is used needs to meet specific criteria. For instance the UL 1061 Style dictates that the wire needs to be 80C, 300 VAC, and pass a Horizontal flame test. The PVC needs to be extruded onto the wire and have a minimum thickness of 9 mm minimum, with a minimum thickness of 7 mm at any point. To be able to offer a UL rated wire, each producer needs to submit their wire to UL for certification and only after passing the required testing can they offer a rated wire. For any given rating there are anywhere from hundreds to thousands of producers around the globe who all must build the wire under the same criteria. Hookup wires are the basic building block of any cable. Whether it is multi-conductor cables or multi-pair cables hookup wires are the start of them all.